Season 2 Episode 11 of the LiveCampWork Podcast! 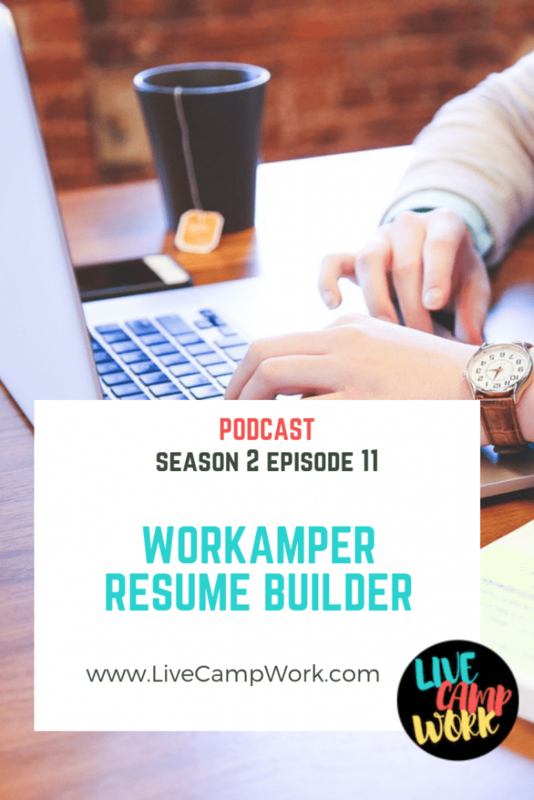 In this episode I want to talk about the Workamper Resume Builder offered by Workamper News. I’ve received quite a few emails regarding resumes over the last few days, and want to provide some insight on what you need to know to grab a great Workamping job using this valuable tool! Later this summer, I’m going to be publishing the Ultimate Guide to Workamper Resumes which is an amazing resource I’m working on completing! I know it’s going to be so helpful in really outline everything you need to know about Workamper Resumes, and will help many people on their way to grabbing that perfect job! The guide will be full of useful information, practical tips, and action steps you can take to make sure your resume is in line with the RV job you want and stands out from the rest, but since it’s still a little ways off from being completed, I wanted to cover one important section to help you guys out right now.